Worms are very efficient recycling machines, and the best part is that these dynamic little garden helpers are not the least bit picky, eating just about any organic material, from old newspapers to kitchen vegetable scraps, and generating rich compost for both vegetable and ornamental plants in the process. Red wigglers (Eisenia fetida), the most abundant species, consume from 25 to 50 percent of their body weight per day. You have to admit that is impressive, even if you are not totally smitten with the concept of worm farming. 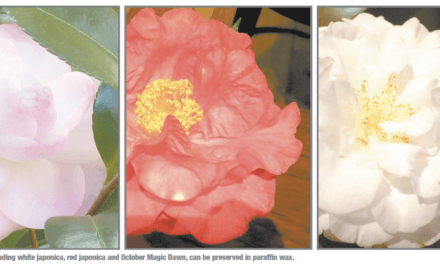 If, however, you are leaning toward having a little fun with worms, this column should give you the basic information you need to succeed, and the real winners will be your garden and houseplants. Worm farming, or vermicomposting, is an inexpensive gardening pursuit. There are some rather fancy commercial worm bins available, but a simple, dark-colored, 14-gallon plastic container into which you have punched holes on the top and sides for ventilation and on the bottom to drain liquid waste will easily accommodate one to two pounds of red wigglers. (Photo | Courtesy of Alabama Cooperative Extension Service) Building a functional and productive worm garden takes little more than a couple of pieces of Tupperware, strips of recycled paper, a soil medium and food scraps. Place your bin above the ground to allow for ventilation and drainage, and you may want to place a tray under the bin to catch excess moisture. Optimum temperature for your worm bin is between 59 and 77 degrees Fahrenheit, and humidity should not be less than 60 percent or more than 90 percent. A garage often provides the perfect conditions. Once your bin is ready, you can purchase your red wigglers at a bait shop, although it is better to find a supplier who sells by the pound. You can also buy from suppliers on the web, but it is important to make sure your worms are domestic. Fellow “vermicomposters” are a good source of advice about buying your worms. 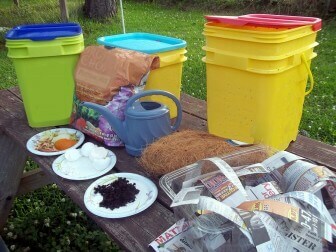 Newspaper and cardboard make good food and bedding when outfitting your worm bin. After cutting newspaper into 2-inch strips and cardboard into small pieces, soak and wring out enough of this material to loosely fill half your bin. Add a handful of garden soil to your worms and the material in which they were shipped, place the combination on top of the bedding and cover with fresh bedding. Once the worms have acclimated to their new home and need additional food, add an inch or less of food scraps and cover with additional bedding. Feed worms low-moisture foods until you are comfortable gauging how much your worms consume. 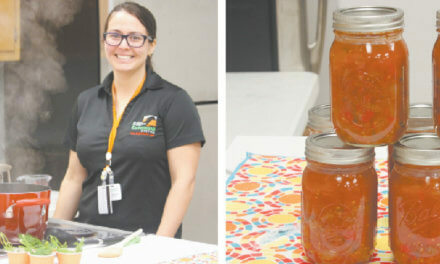 Plant-based materials lower in salts and acidity that have been chopped into small particles are the best food source for worms. Too much food will result in rotten scraps and a smelly bin, but underfed worms will try to escape their bin in search of food, so checking the bin regularly to ensure there is neither too much nor too little food is important. Wait until all food has been consumed before adding more. In general, worms can be fed about every other day. Compost and castings (worm manure) should be harvested every few months. The easiest way to do this is to start by not feeding the worms for several days so there is minimal food in the bin. Carefully move the contents of the bin, including the worms, to one end of the bin. Place fresh bedding in the empty space, add fresh food scraps and cover with fresh bedding. When the hungry worms migrate to the fresh bedding in search of food, remove the vermicompost from the other side and replace with layers of bedding and food. 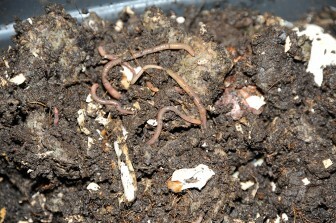 During the composting period, the worms will have multiplied. The goal is to reduce the number of worms to approximately the number with which you started. Excess worms can be harvested as fish bait or used to start an additional composting bin. Vermicompost is an excellent slow-release organic fertilizer that suppresses some soil-borne diseases. It can be used to amend soil and added to potting mixes for indoor and outdoor plants. You can also make compost tea to use as fertilizer by steeping two tablespoons of vermicompost in one quart of water for 24 hours. Use the tea within 24 hours of brewing. 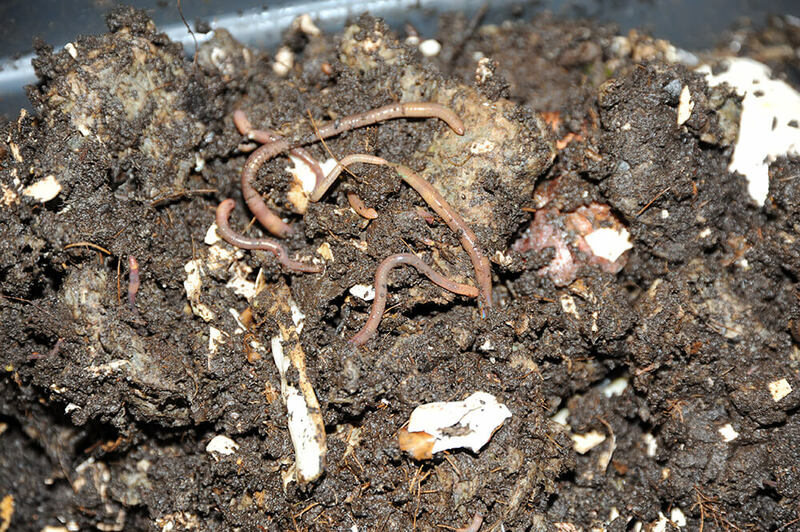 For more information about vermicomposting, check ANR-1469 (Vermicomposting: Worms at Work) at www.aces.edu under publications. Happy worming. When: April 1-3 from 9 a.m. to 4 p.m.